Precarious work in Ireland is not new. Since the foundation of the ITGWU over 100 years ago and later SIPTU, it has been an almost constant feature of the Irish labour market over the past 100 years. Casual labour on the docks in Dublin since the turn of the 20th century, agricultural labourers working across thousands of Irish farms, the emergence of fixed-term workers in the 1990s and work- place innovations that saw the development of the temporary agency worker in the early 2000s and more recently, ‘if and when’ contracts. Each time, the union movement has responded by organising workers in those sectors and in latter years ensuring that legislative protections are put in place to create a level playing field between permanent and insecure workers. What is new is that precarious work is now emerging in sectors previously thought unimaginable such as third level education and that for some sectors, particularly those that rely on digital plat- forms, their business model or the very basis of their business de- pends on precarious work practices to operate and survive. We know from the CSO’s labour force survey data that in the education sector, just one in eight workers were on temporary contracts in 1998. This rose to one in six in 2014 and was one in seven in 2017. If we were to specifically take third level education employment alone, those figures would be much worse. By its very nature, the concept of precariousness is hard to define. We combine various definitions used such as uncertainty of hours and tenure and vulnerability with regard to amount and frequency of pay. However, the numbers only tell part of the story. This is where some commentators fall into the trap that if it isn’t measured, they don’t believe it. Well the reality is that there is no full comprehensive measurement for what we believe to be precarious work. And the reason for that relates to the issue of risk. Risk is the defining characteristic of insecure work and the greater the risk or responsibility borne by the worker as opposed to the employer for a worker’s security of income, stability of employment and access to social security, the greater the precariousness of that job. Not all insecure work, such as self-employment, is necessarily precarious; similarly, as we know from the dependence on the Family Working Payment (formerly FIS), not all full-time permanent work guarantees adequacy of income. Our lack of understanding of self-employment is one of the biggest obstacles to understanding precarious work although we get some insight from Revenue Commissioner data. In 2016, some 41% of Class S PRSI contributors (self- employed not including proprietary directors). They had a gross income of €20,000 or less. In that context, no single type of work or occupation can be classified as precarious. However, we understand that those in full-time temporary employment and those reported as being in part-time under-employment are at most risk. CSO labour force survey data suggests that in 2017 just over 175,000 workers found themselves in this situation. Alongside this, the Department of Social Protection has produced a very conservative estimate of 7,500 workers in disguised self-employment, a figure many at the coalface of organising in the construction sector would contest as too low. The focus on precarious work to date has been on workers’ lives and rightly so. TASC’s recent re- port Living with Uncertainty excellently details the day-to-day lived experience of those working in precarious jobs and the adverse implications arising from this type of working life for housing security, self-care in terms of health and family formation decisions. Similarly, there has been a lot of research undertaken internationally on the lifetime impact of initial work conditions when young workers enter the labour market. Well-known work by Autor and Houseman (2010) in the US looked at the so-called stepping stone effect from temporary agency work and fixed-term contract work into permanent work and the initial work experience on employment prospects and lifetime earnings. Compared with fixed-term contracts, those in temporary agency work had a lower probability of getting permanent employment and endured a larger earnings penalty over a longer period. CSO’s labour force data tells us that the share of young workers aged 25-34 in temporary work has been edging up over the past two decades. In 1998, some 6% of all 25-34 year-olds were in temporary work. At the height of the economic crisis here, this share rose to 10% in 2012 and it was 8% in 2017. With regard to part-time work, almost one-quarter of all those in employment in 2017 under the age of 35 were in part-time employment, up from less than a fifth (18%) back in 2008. If we consider that a share of younger workers is combining work and study, this figure alone need not give cause for alarm, provided young workers have access to consistent hours and decent pay, irrespective of the contract type. However, 10% of those aged 24 and under who are working part- time reported being under-employed. It is these workers that we regard as being in a particularly precarious work situation. While we don’t know the precise reasons for that underemployment, there are strong grounds to believe that this is part of the exploitative culture in certain sectors where ‘if and when’ contracts and variable hours exist. When employment began to recover in 2013 and 2014, a key feature of that recovery was an increase in the availability of temporary and part-time work. Five years on, almost all new jobs are in full-time employment, giving rise to a debate in some quarters as to whether insecure employment was merely a temporary feature of the recovery. It is not. Technology and the increasing concentration of market power by companies in certain sectors means that the power balance between workers and employers is greatly skewed. In that context, precarious and insecure work will remain part of the workplace landscape. Overcoming it requires stronger unions and more collective bargaining – something SIPTU members are striving for every day. In October, James Bloodworth will speak to SIPTU Health Division members at the Division’s biennial conference about his book on Precarious Work. Hired: Six Months Undercover in Low-Wage Britain. For all those seeking to better understand the main battle for the Irish trade union movement in the coming years, the recently published report ‘Living with uncertainty: the social implications of precarious work’ is essential reading. The report produced jointly by the trade union-backed think-tank TASC and the Foundation for European Progressive Studies, examines the current rise in precarious forms of work and how they adversely impact on individuals and Irish society. One of its stark conclusions is that for many, work no longer represents a reliable route out of poverty. In the report, precarious work is identified as low paid work which is either part-time with variable hours, so-called “if-and-when” contracts, temporary, and solo self-employment (also known as “bogus self-employment”), or a combination of these employment situations. It found such forms of employment to be widespread in healthcare, education, archaeology, transport and storage, the postal sector, the arts, media and construction, as well as in retail, catering, hairdressing, hotel work, bar work and contract work, such as cleaning and security. Participants interviewed for the study, which included several SIPTU members fighting for improvements in the pay and conditions of low paid, contract workers, said the unpredictability of precarious work affected them physically and mentally, often making them ill. Many, however, “could not afford” to be ill, as taking time off meant not being paid. Many were also victims of the interplay between precarious work and that other great threat to the quality of life of workers in Ireland, the worsening housing emergency. Precarious workers often have no choice but to rent or to live in the family home. Those working in non-standard employment are unlikely to be approved for a mortgage while renting in the private market has become prohibitively expensive. This can lead to a lack of independence, with adults unable to leave the family home or lead independent lives and can have severe adverse effects on children. From this malign influence on family life, it is clear that precarious work presents an intergenerational challenge, which if not tackled effectively will deepen inequality and drive communities further apart along economic lines. The report does not shy away from highlighting the strong ideological dimension to the rise in precarity. In many cases, the introduction of precarious work was spun as being about businesses having to make ‘hard choices’ during the recession with an increase in ‘flexibility’ by workers key to a wider economic recovery. Factually, this was just not the case. The report states clearly that some of the industries with the highest profits during the recession were the most relentless in the roll-out of insecure contracts. The spread of such employment practices was also driven by political pressure. The aim was often to drive down unemployment figures rather than a focus on the quality of the employment being created in both economic and social terms. As with the great battles against casual work practices and horrific conditions that were won in the early decades of the last century in Ireland and across much of Europe and North America, unions will be at the forefront of the war on precarity. The TASC report presents further evidence that precarious working conditions thrive in sectors where there is a lack of worker organisation and were dreamt up by political conservatives as a way of undermining unions in areas where they were strong. It took many years, and the production of much false, ideologically driven research concerning the supposed economic and social benefits of ‘flexible’ working conditions, as well as the opportune use of economic crises, to drive the precarious work agenda to where it is now. It will similarly take much hard work at the industrial, political, community and district council level by trade unions to drive back the wave of human misery caused by low paid, insecure and often unsafe work. The term “precarious workers” refers to low paid, part-time employees who work irregular or variable hours, or those on full-time, short-term contracts. Many people in these situations are paid only for the hours they actually work and therefore their income is insecure. From a workers’ point of the view, a simple definition of precarious work is employment which is perceived to be “insecure, uncertain or unpredictable”. Being forced into such an employment situation means these workers are unable to secure loans or mortgages or to make financial plans. Precarious employment is also linked to negative physical and mental health, as well as offering little opportunity for career progression. Precarious work is not a new concept. In its current guise, it is linked to the spread of neoliberal economics and the emphasis placed on a ‘flexible’ workforce. With the onset of the global financial crisis, its increase has become a key concern for workers in nearly all sectors of the economy. SIPTU Health Division Organiser, Paul Bell, said: “It may be a strong charge but I believe precarious work is not unlike a legalised version of modern day slavery. In many cases, bosses demand that employees immediately respond to a call to present for work. Should they fail to do so, the contract of employment can be terminated. Many workers on precarious contracts are also forbidden to work for other companies. It is interesting that this practice is accepted by employer organisations, many of whom rest on their defence for precarious work on the legitimacy of flexibility. Precarious work practices have spread throughout the economy. These are just some of the sectors affected where SIPTU members are organising to confront them. The sector has three types of provider – public, voluntary and private. The first two are fully funded through the HSE. The average rate of pay for a public sector Home Help is €15 per hour; the voluntary sector rate is €11.50– €12.50 per hour, and in the private sector, the rate of pay averages approximately €10.50 per hour. In the private Home Care Sector, “if-and-when” contracts are the norm, meaning not only do workers lack guaranteed hours but they also don’t know from week to week what hours they will be working. The lack of security extends to complaints made against them by a client; if a client makes an allegation against a carer they are instantly let go. Precarious home care workers in the private sector receive statutory maternity leave, but it is unpaid. While they are entitled to take holidays, it has to suit the employer. There is also a large amount of unpaid work in the private sector in the form of travelling time from one client to the other. Staff turnover is high in the private sector. Have you heard about our Cork Big Start Early Years Committee? There are 23,000 workers in this sector, who are predominantly female and whose average rate of pay is €10.27 per hour. They have no pension scheme, very few workplaces have paid maternity leave, and they receive the statutory minimum of 20 days’ holidays. Early Years educators get paid for the hours of contact time they have with a child per day. However, this does not take into account the extensive work that is done outside of those hours such as observation reports, preparatory work and administration. The precarious nature of work in the sector results in an annual staff turnover rate of approximately 26%. This is a consequence of the limited scope for career progression, including pay increments for Early Years Educators. A high turnover in the sector has further implications for the quality of childcare services in Ireland because the highly educated and professional staff cannot be retained. We spoke to students who are fed up with ZERO HOUR CONTRACTS and want A LIVING WAGE. The best way to break the cycle of precarious work? There have always been workers employed in a precarious manner in this sector doing occasional lecturing and tutoring. However, it is estimated that there are now at least as many people on precarious contracts as permanent contracts. Lecturers and tutors hired on a part-time hourly basis are paid for the hours they teach. This payment is said to be inclusive of preparatory work. However, they are not being paid for follow-up or administrative responsibilities. Many others are retained on short-term contracts. The implications this has for academics are wider than simply the direct impact on their lives. It also creates an atmosphere of self-censorship, meaning they are less likely to partake in vigorous, academic debate. Many are also constantly anxious about reaching the end of their contract and having to put much of their energies into applying for new employment rather than focusing on publishing or doing research. The financial sector has also seen an increase in temporary contracts and outsourcing. In the credit unions, new entrants are being brought in on one-year, fixed-term contracts. This has followed changes relating to mergers and amalgamations, resulting in management claiming it may not be in a position to say what kind of staff needs they will have in the future. For “permanent” staff in this sector, there is also a growing trend towards ‘performance management’ which means that over a two-year period a contract can be terminated on the grounds of capability. Therefore, while permanent workers may not be contractually precarious, they do feel precarious, and this is an example of a sector where the issues facing contractually precarious workers are seeping into the working conditions of permanent workers. Most people working in restaurants are employed on a casual basis, with part-time contracts and irregular hours of work. Workers often only find out from week to week what their hours will be. People employed in the restaurant sector often work long hours on a flat rate. Workers often report unpaid work such as doing overtime, where management will attempt not to pay them for the extra hours they worked. Furthermore, when they are paid for overtime, it is on a flat rate, regardless of whether they worked day or night. It is difficult for workers to challenge management in these circumstances because they can be punished by not being put on the roster or having their hours decreased. Another issue is workers being asked to work unpaid for a “training period” before they are officially employed. During the economic “boom”, employers and agencies in industries such as meat production and vegetable processing specifically targeted certain countries to bring in migrant workers on minimum wage, with no security of employment or entitlements. Typically, contracts in the meat or vegetable processing industries would be on an “if-and-when” basis and would involve something along the lines of “up to 48 hours”. In many cases, people do not have a written contract. It is also common for workers to live together in crowded accommodation and pay rent to their employer. When it comes to fruit and vegetable picking, workers can also be paid on a productivity measurement system, for example being paid for the total weight of the product they pick. There is a high turnover of people, and the precarious nature of the work leaves people feeling too vulnerable and frightened to act collectively to improve their working conditions. Since the financial crisis, the construction industry is organised differently to how it was previously when large construction employers had high levels of direct employment. Now, the predominant form of employment for technical operative grades is through agencies that employ them on an if-and-when basis. Among the trades, bogus self-employment features highly. It is also rare for agency workers to be offered a mandatory pension scheme to which the employer contributes. Often construction workers have disputes with the agencies over holiday pay that is outstanding to them. Bogus self-employment in the craft trades is forced on the workers; they are told that if they want the job, they must register as self-employed, or else the job will go to someone else. By forcing a self-employment status on trades’ people, this leaves them bereft of any protection in employment law. A generation ago, a hotel was considered a good place to work because there was career progression. Now it is very rare to find contracts in the sector with fulltime or even part-time guaranteed hours. This was triggered over 10 years ago when employers began to hire people with neither qualifications nor experience to work in the sector. This culminated in the de-skilling of the workforce, and consequently, employers could justify diminishing the contract terms and conditions for new entrants on this basis. The biggest problem for a lot of workers in the hotel sector is rostering. They can be rostered in for certain hours and on certain days, only to find out on their arrival to work that they are not needed. Workers in the hotel sector are also being pushed to do more work in less time, with housekeeping staff, in particular, suffering from so-called ‘speed up’, resulting in increased incidents of injury. We live in precarious times. Tens of thousands of workers in Ireland wake up early in the morning unsure whether they will earn a living that day, or whether they will earn anything at all. Ending the scandal of precarious work is a significant challenge facing workers and their trade unions in Ireland. It affects workers across a range of employment sectors, including hotels and restaurants, early and third level education, retail, child and home care services, home care, construction and agriculture, to name just a few. The spread of casualisation, ‘if and when’ and zero hour contracts under which mainly low paid workers are forced into uncertain irregular hours of employment and short-term contracts must be stopped. The system destroys the physical and mental health of workers and forces them into a cycle of endless poverty. Precarious employment means a worker only gets paid for the hours they work, often doesn’t know when they will be employed and are denied the benefit of even meagre pensions, holiday and sick pay. Pushed into long-term, low paid precarious work, often without any contract of employment, young workers are unable to secure the loans, mortgages or the rent they need to make plans for a decent home and family life. For employers, the attraction of casualised employment, or of outsourcing work to sub-contractors, means they are freed of their obligation to meet their responsibilities to provide for the health and well-being of their employees including their entitlements to normal career progression, holiday and sick pay and decent welfare and retirement benefits. This is not a new scandal. Indeed, the modern Irish trade union movement, including SIPTU, was moulded in the resistance of low paid workers to casualisation, low wages and extreme poverty in the early years of the 20th Century. Over decades of struggle, improvements in wages and in their terms and conditions of work, including the reduction in working hours, were won across the economy and the country by an organised and unionised workforce. Advances were made by women workers demanding equal pay for equal work, the introduction of, and increases to, a minimum wage and in the creation of industrial relations machinery to tackle exploitation and discrimination by ruthless employers. Many of those welcome changes are in danger of being reversed on the new battleground where workers are forced into anti-social work practices which undermine hard-won employment standards. The spread of precarious, casualised work is endemic across the country, as it is across other EU states and the scale of mistreatment by some employers of workers, over whom they exercise control by virtue of the insecure jobs they provide, is massive. Over 160,000 workers cannot rely on steady and guaranteed hours from day to day, week to week or month to month. The abuse of bogus self-employment means that 10% of workers in Ireland are wrongly described as sole traders who do not employ anybody else. It is deeply shocking that 44% of workers between 18 and 29 years, or almost 100,000 young people, are on short-term contracts in the Republic. The figures in the North are similar with a 25% increase in the number of workers in temporary employment since 2008. These figures make a lie of the claim that the economic recovery is lifting all boats. There has certainly been a dramatic reduction in the numbers of unemployed which has come down from over 15% in the depth of the recession to just over 6%. Behind this statistic, however, is the cruel reality that many of the jobs created in recent years are in low paid, precarious employment. Women, in particular, who have taken up tens of thousands of jobs in the recovering services sector, find they are unable to meet the costs of childcare, rent and other basic needs from the wages they receive. Migrant workers and young people entering the workforce are equally marginalised when it comes to decent work and properly paid jobs. By driving down wages and standards, casualisation will also undermine those with secure, better-paid jobs across the economy. The attempt by employers to drive down wages and demolish employment protections in Ireland will undoubtedly intensify when Brexit takes hold as their competitors in the UK seek to remove hard-earned worker’s rights, as well as the environmental and consumer protections, required under EU laws. SIPTU has joined with Congress and other interested organisations and groups in determined efforts being made to strengthen the law and the rights of employees and to get rid of zero hour and so-called ‘if and when’ contacts, most recently under the Employment (Miscellaneous Provisions) Bill currently passing through the Oireachtas. The Bill is an important piece of legislation to assist vulnerable workers but is flawed, in many respects. 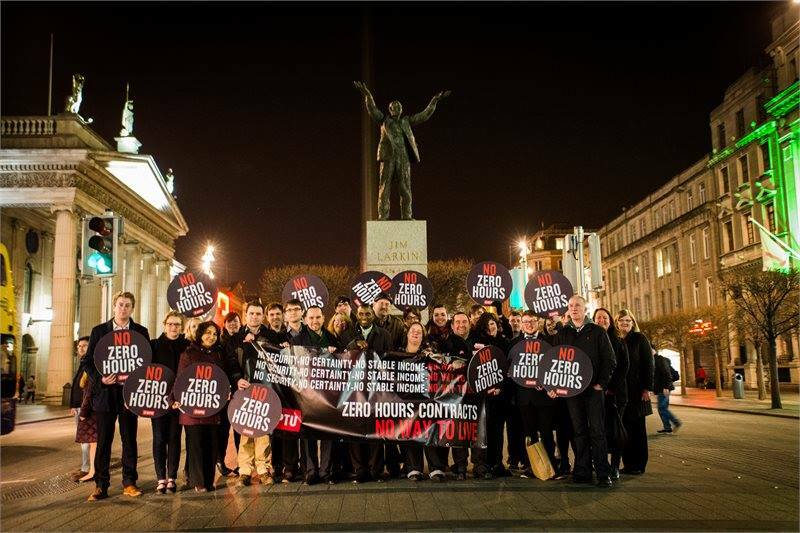 The Government has claimed that under the proposed legislation, zero hour contracts will be banned. However, this is disputed by opposition parties while SIPTU, the ICTU and other unions are lobbying for substantial amendments in order to ensure that precarious work is tackled in a meaningful way and that zero hour and ‘if and when’ contracts are completely eliminated. The first defence for workers facing unscrupulous employers seeking to diminish their wages and conditions is to join a trade union. For SIPTU the scandal of precarious work is a top priority among the various campaigns which union members are pursuing across all employment sectors in which we organise. Join the campaign in the battle against precarious work.